I’m growing increasing sure that Directors and ‘senior’ members of Swindon Borough Council have deliberately and consistently stifled democracy and the proper functioning of the Council’s scrutiny committe to spare their own blushes and hide mistakes. To the delight of his friends in the ruling Conservative group, Derique Montaut, the Labour ex-chairman of the scrutiny committee, appears to have allowed himself to become moulded into the ‘Mr Magoo’ of Swindon Borough Council. Cllr Montaut has become effectively ‘blind’ in his duty to hold to account the council’s Conservative administration. Derique means well but it must be said that he has a well defined history of bungling things, usually to the political advantage of the opposition parties but in March 2010, when he took possession of a ‘confidential’ report into the activities of the Councils Director for Business Transformation – Hitesh Patel – and apparently agreed to restrictive caveats regarding the confidentiality of the report, Deriques bungling had reached a new low point and democracy was dealt another blow in the name of Rod Bluh’s failing wifi scheme. Can anyone seriously conceive that it is democractically ‘acceptable’ to hand a report to the chairman of a Scrutiny Committee but attach such caveats of confidentiality to it which made it, (in Deriques limited understanding), impossible for him to discuss the report with the rest of the scrutiny committee, let alone publicly scrutinise it. 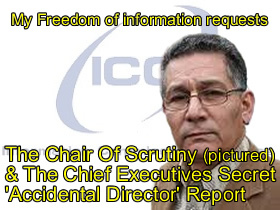 My freedom of information request is directed to the Chairman of the Scrutiny Committee, Councillor Derique Montaut. The Scrutiny committee of Swindon Borough Council has spent a considerable amount of committee time scrutinising the Public/Private partnership between Swindon Borough Council and Digital City (UK) Limited and hearing and answering representations from members of the public who have expressed serious concerns over many aspects of the partnership, often submitting public record documents to demonstrate that their concerns are supported by facts. There remains considerable public interest in the Chief Executive’s report into Hitesh Patel’s, (Swindon Borough Council Director of Business Transformation), supposedly ‘accidental’ directorship of Digital City (UK)Ltd, which began before the Council lent Digital City (UK) Ltd £450,000 of public funds, but remained undisclosed to the Council for more than 5 months until his Directorship of the company was exposed by members of the public. 1. On what date did the Chairman of the Scrutiny Committee, (Councillor Derique Montaut), receive the report into Hitesh Patel’s ‘accidental’ directorship of Digital City (UK) Ltd? 2. Did the chairman of the Scrutiny Committee agree to any pre-conditions of confidentiality before he read the report? 2a. If so, what were the terms of confidentiality? 2b. Did Councillor Montaut agree with them? 2c. Did Councillor Montaut comply with them? 2d. Who requested or imposed those terms of confidentiality? 3. Did the Chairman of the scrutiny committee, (Councillor Derique Montaut), show or discuss the contents of the report with any other members of the Scrutiny committee? 3a. Did the Chairman of the scrutiny committee, (Councillor Derique Montaut), show or discuss the contents of the report with any other elected members or employees of Swindon Borough Council? 3b. Did the Chairman of the scrutiny committee, (Councillor Derique Montaut), show or discuss the contents of the report with any members of the general public? 4. Did the Chairman of the scrutiny committee, (Councillor Derique Montaut), show or discuss the contents of the report with the political assistant to the Labour Group of Swindon Borough Council? 5. Has the Chairman of the scrutiny committee, (Councillor Derique Montaut), been approached by any other elected members, employees of Swindon Borough Council, or members of the general public who wished to discuss the contents of the report with him? 6. How many copies of the report exist? 6a. Who has each copy? 6b. Whether other holders of the report have discussed its contents with other elected members, or employees, of Swindon Borough Council? 7. Does the Chairman of the scrutiny committee, (Derique Montaut), accept the findings of the report and believe the statements made within are factually correct and honestly presented? 8. Does the Chairman of the scrutiny committee, (Derique Montaut), believe that, in light of the high level of public interest in, and scrutiny of, the public/private partnership, that the report should be fully examined and discussed by the scrutiny committee in an open and accurately minuted meeting of the committee? 9. Does Councillor Montaut believe the statements made within the report are factually correct and credible? 10. If the chairman of the Scrutiny committee still has a copy of the report would he please supply a copy to me. 11. If the chairman of the Scrutiny committee no longer has a copy of the report will he be requesting another copy? 12. If the Chairman of the scrutiny committee were to acquire another copy of the report, is he confident that he remains sufficiently familiar with the original copy that he would spot any changes made to the newer copy? Derique Montaut is not fit for purpose in my honest opinion, and he should seriously consider his position as Chair of Scrutiny. What Cllr Montaut ought to do now is discuss his actions, and my FOI, with the Labour group at their regular meeting tonight. Instead though, I imagine that he’s already beaten a path to the office of the Tory leader of the council, (Rod Bluh), to ask him what he should do. Then I expect him to trot anxiously along for a chat with the borough solicitor before having a good sob on Peter Mallinsons shoulder by late afternoon. Cllr Mallinson, we should remember, is a long time friend of Deriques – and was previously a Labour councillor before defecting to the Tories and becoming the lead member for Adult Services & Bluh’s chief whip. As for the Labour group, they must realise that Monty is the single biggest reason why they cannot function effectively as the largest party of opposition. The Liberal Democrats don’t appear to do much apart from keep their heads down which leaves the Bluhligan administration pretty much free to do whatever it wants within the chamber because it is not being held properly scrutinised or held to account by the opposition groups. I think we’re fast approaching the time when Parliament might need to become involved again. *Councillor Montaut was replaced by Cllr Kevin Small** as Chairman of the Scrutiny Committee in May 2010, three months after he helped keep the Chief Executives ‘secret’ report, erm… secret. The Rotten Borough of Swindon.